While all rodents may seem alike, when it comes to destruction, rats stand above the rest. 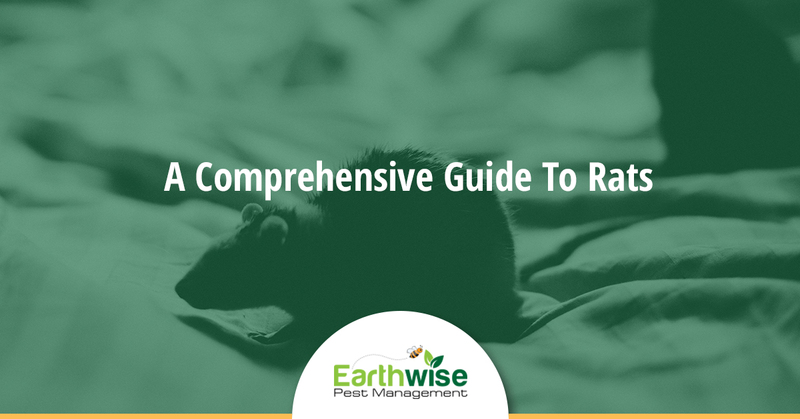 No homeowner wants to have any pest invade their abode but when rats take up residence in your home, you will wind up with bigger issues on your hands. From damaging your home to contaminating your food, these furry critters will quickly take over your property, leaving destruction in their wake. Here at Earthwise Pest Management, we not only provide an array of pest control services, we also make it our goal to help educate our clients on the creatures that invade their homes. When you work with our Sacramento pest control company, you will be working with an expert team who is equipped to help you get to the root of the issue. If you think you might have a rat problem on your hands, we invite you to read on to learn everything you need to know about this dangerous and invasive rodent. Similar in build to a common house mouse, a rat is a larger rodent that originates from Asia. Due to their ability to survive in almost any condition, you will find rats around the globe occupying the same spaces as humans. The only large area on earth where rats are not present is on the continent of Antarctica, due to the harsh weather conditions and lack of human habitation. Other places throughout the world strive to become rat-free zones, but due to the pluck of these creatures, ridding a populated area of their presence is extremely difficult. Rats can live in a variety of places, including homes, buildings, farms, gardens, and open fields. Some rats will live in nests located on ground level, while others will nest above ground in shrubs, trees, or, in the case of home’s, attics and ceilings. Where a rat resides will vary depending on the specific rat type in question. Here in California, we have two distinct types of rats that invade our properties — the Norway rat and the roof rat. These two rats are similar in appearance but have a few distinguishing features that make them unique. A Norway rat is also referred to as a sewer rat and prefers to nest low to the ground. These rats will often reside in your woodpile, garden, or even in your basement. The Norway rat is an extremely common rat across the nation and will quickly populate any area where humans reside. A bit smaller than a Norway rat, the roof rat is well known for its ability to climb anything. Roof rats, as their name implies, nest above ground. In nature, they opt for trees, shrubs, and other high locations. In your home, a roof rat will prefer attics, ceilings, and other elevated locations. A Norway rat has an incredibly long tail, measuring longer than their head and body combined. This tail allows them to easily climb and balance as they take on new heights. It is very likely that you will never see rats when they infest your property. Generally, a rat infestation is identified through their activities and the trace they leave behind. If you do see a rat, you can distinguish it from a mouse based on the size of the animal. Even a young rat will have a much larger head and feet than a house mouse. Once you see a rat or notice their presence, it is very likely that you will have a full-blown infestation on your hands in no time at all, which leads us to the lifecycle of a rat. Depending on which rat type is infesting your property, you will be facing different lifecycles. A Norway rat will usually have four to six litters per year, totaling around 20 offspring. A roof rat will usually have around three to five litters in a year, totaling around 30 to 40 babies annually. Rats live anywhere from one to two years. As with most pests, the fact that they produce such a large number of offspring per year, their short lifespan does not mean they are easy to eradicate. A rat is a nocturnal animal, with most sightings occurring at dusk or after. Both roof rats and Norway rats will eat a huge variety of food. Roof rats are well-known for eating fruit, including fruit that is still on the tree. Norway rats are preferential to grains, nuts, and meats. Both rat types will gladly pilferage through any pantry and their sharp teeth allow them to gnaw their way into almost any package. Once rats have been detected on your property, it is time to call in the pros from Earthwise Pest Management. Our team will help you return your home to safety through the appropriate pest control methods. Talk to our pest control company in Sacramento today to learn more.